Over time, you may have identified barriers that women in your setting (country, region, or territory) face in preventing a pregnancy or gaining access to consistent, effective, and affordable contraception. Additionally, your setting may have a public health emergency, where prenatal exposure poses a severe risk to pregnant women and infants. In both instances, it is critical that women have access to high-quality contraceptive services to improve health outcomes for women and infants. Design and implementation of a program or intervention that offers women who choose to prevent pregnancy access to contraception is possible with the right tools, whether the need is longstanding or urgent. This Section introduces initial activities for building an effective, sustainable intervention. Wherever possible, we have included templates, checklists, Zika Contraception Access Network (Z-CAN) examples, and lessons learned (defined for this toolkit as the learning gained from the process of implementing the Z-CAN project) to help with your program or intervention planning. 1.1 Why is Building Partnerships Important? Why is Engaging Key Stakeholders Critical? Strong partnerships are fundamental throughout design and implementation, and taking the time to identify key stakeholders at all levels and engage them in the planning process is critical. This process provides opportunities to fully understand the context, need, and best ways to reach the target population; to learn what has been previously or currently implemented; and to identify barriers to successful implementation. Additionally, involving a diverse group of stakeholders allows you to capture their ideas and concerns early in the design phase and incorporate them into the intervention. Different settings will require different partners. During the 2016–2017 Zika virus outbreak in Puerto Rico, the National Foundation for the Centers for Disease Control and Prevention (CDC Foundation), with technical assistance from the Centers for Disease Control and Prevention (CDC), built a network of public and private partners to provide context, guidance, and feedback on the program development. Take time to consider which agencies and organizations are important stakeholders that should be part of the partnership network in your setting. Once an agency or organization is identified, find a representative who is committed and willing to be engaged throughout the process. 1.2 What can we learn from a needs assessment? Where do women access contraception? Is there an adequate number of contraceptive service access points? What contraceptive methods are available? What barriers do women face (clinic access, insurance coverage, knowledge and attitudes about methods, and other barriers)? This combined information will provide a comprehensive overview and a strong foundation for the new program or intervention. Taking into account the historical context and lessons learned allows your team to create an intervention that aligns with and complements other current or past interventions. 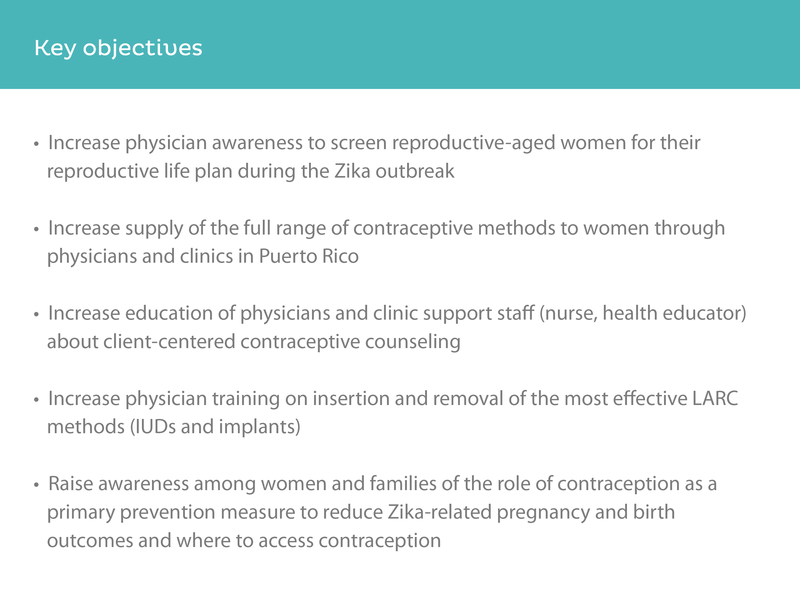 The needs assessment conducted during the 2016–2017 Zika virus outbreak in Puerto Rico used a review of existing data and key informant interviews to gather information on contraception services in Puerto Rico. This included information on rates of unintended pregnancy, contraceptive prevalence (method mix), contraceptive access, and barriers to provision and use of contraception. Where data was not available, federal partners, key stakeholders, and family planning providers filled information gaps. 1.3 What are the critical components in planning a program or intervention? It is important to have a plan or roadmap in place to guide the program or intervention design, implementation, and evaluation. Based on the needs assessment and key stakeholder feedback, program staff can develop a comprehensive plan to ensure successful implementation and evaluation of the intervention. The implementation plan may include a detailed list of activities, who is responsible for each activity, activity status, costs, expected challenges, and timeline (start and end date) to achieve the objectives of the program or intervention. The evaluation plan is a written document that describes how you will monitor and evaluate your program, so that you will be able to describe the “What,” the “How,” and the “Why It Matters” for your program and use evaluation results for program improvement and decision making. In the early phase of Z-CAN program development, program staff documented the public health problem and unmet need and defined the target population; developed program goals, objectives, and strategies; and developed an implementation plan, including a timeline and budget; and an evaluation plan. Identify the problem: The threat of adverse reproductive health outcomes was associated with Zika virus infections during pregnancy. Document the need: Approximately, 138,000 women in Puerto Rico were estimated to be at risk for unintended pregnancy at the onset of the 2016–2017 Zika outbreak. In addition, the number of health care providers in Puerto Rico who offered contraception, specifically LARC, was limited by reduced availability of the full range of contraceptive methods, lack of training, and inadequate reimbursement. Define the target population: All women of reproductive age who chose to prevent pregnancy during the Zika outbreak were eligible to receive Z-CAN services, regardless of age or insurance coverage. Primary goal (of the Z-CAN program)–Reduce adverse Zika-related pregnancy and birth outcomes by preventing unintended pregnancy during the outbreak in Puerto Rico. Primary strategy – Increase access to contraception by offering women who choose to prevent pregnancy during the Zika outbreak same-day access to the full range of U.S. Food and Drug Administration (FDA)-approved reversible contraception methods at no cost. 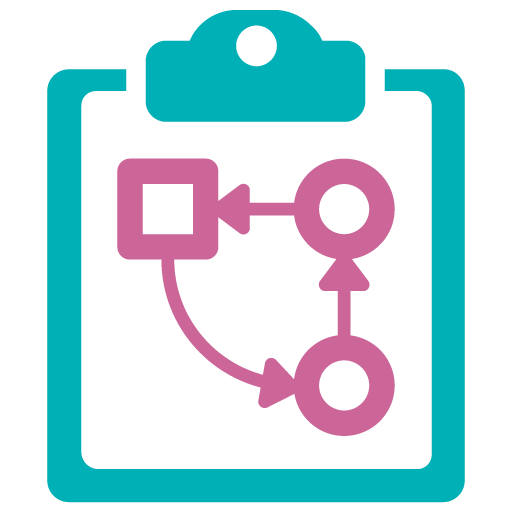 Develop an implementation plan: The Z-CAN Implementation Plan provides a detailed list of activities, including who is responsible for activity, status, and timeline (start and end date) to achieve the objectives. Develop an evaluation plan: The evaluation plan provides guidance on the monitoring and evaluation activities needed to assure that the goals and objectives of Z-CAN are achieved. Furthermore, the evaluation plan can help organize data collection, analysis, use, and data quality. 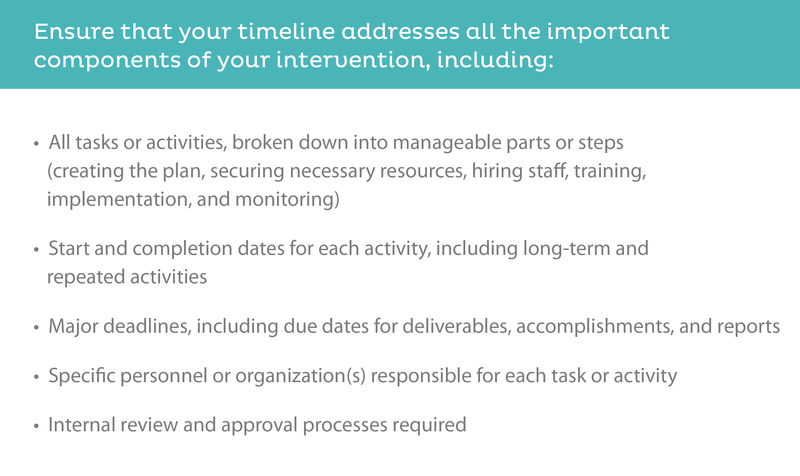 Establish a timeline and budget: Central to the program plan, a timeline that covers all phases of an intervention, including key deadlines and milestones, is essential to achieve the program objectives. 1.4 How can we improve access to the full range of contraceptive devices? Lack of access to contraception can lead to unintended pregnancy and adverse maternal and infant health outcomes. Efforts to improve access to contraception should focus on reducing barriers women may encounter in selecting and obtaining contraception. Giving women access to the full range of contraceptive methods will ensure they can choose a method that fits their needs and lifestyle, facilitating informed choice and decision making. In general, government entities, both domestic and global, procure contraception methods for family planning programs in their respective settings. In some instances, non-governmental organizations may procure contraception for organizations working with reproductive and sexual health programs and provide contraception as part of their counseling and health services. 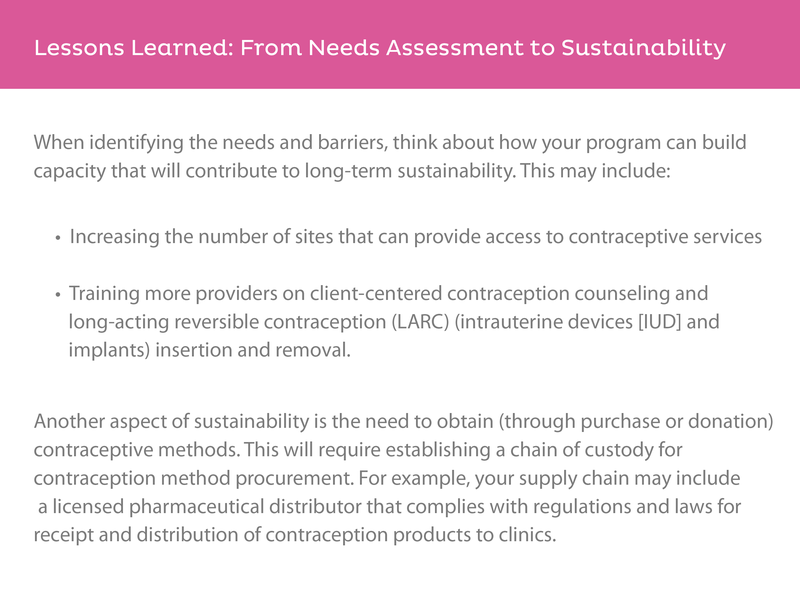 During the program planning process, assess what contraceptive methods are available and if there are any challenges related to contraception method procurement, distribution, and reimbursement systems. 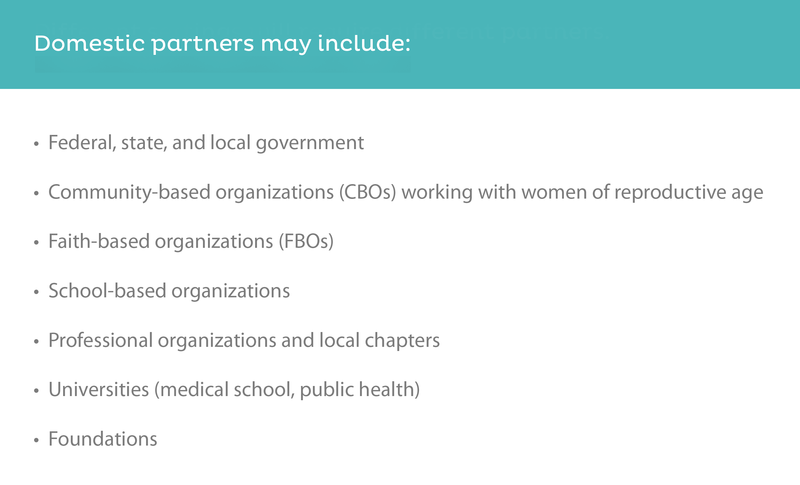 If government entities are not able to provide women the full range of methods, leveraging partnerships that government agencies or non-governmental organizations have with manufacturers may provide options to procure contraceptive methods through donations or at a nominal price. Regardless of how methods are procured, your program must comply with all regulations and laws. Reduced availability of the full range of reversible contraceptive methods and high out-of-pocket costs were identified as major challenges in Puerto Rico. CDC Foundation secured contraceptive products and negotiated nominal pricing from contraceptive manufacturers to supply the full range of reversible contraceptive methods to the Z-CAN program. The Z-CAN program provided each woman with client-centered contraceptive counseling to ensure that she could make an independent decision and had access to the full range of reversible contraceptive methods. Giving women who chose to prevent pregnancy during the Zika outbreak the option to select from the full range of contraceptive methods allowed them to choose the method that best suited their needs and lifestyle. Ethical and historical considerations and safeguards are critical aspects of designing reproductive health or contraception programs or interventions. It is especially important to acknowledge the historical context a setting or group of women may have experienced and to provide opportunities for key stakeholders to share the history and its consequences. Given the global history of coercion some groups of women have experienced—including sterilization, testing contraception methods, or limiting contraception to certain groups—program design must include an ethical review to ensure the program or intervention limits adverse effects or unintended consequences for the women you serve (See Section 5.2). In addition to contraception access barriers, a history of coerced sterilization and concerns for unethical testing of oral contraceptives in Puerto Rico were important considerations for program design. During the Z-CAN program design phase, each contraceptive method donation was reviewed by CDC’s Public Health Ethics Conflict of Interest Work Group, which recommended that the Z-CAN program offer the full range of contraceptive methods and have measures in place to ensure that no woman felt pressured to make choices related to a contraception method. The Z-CAN program offered women the full range of reversible contraceptive methods and provided client-centered contraceptive counseling to ensure autonomous decision making. These essential safeguards were incorporated into the Z-CAN program implementation and evaluation activities. 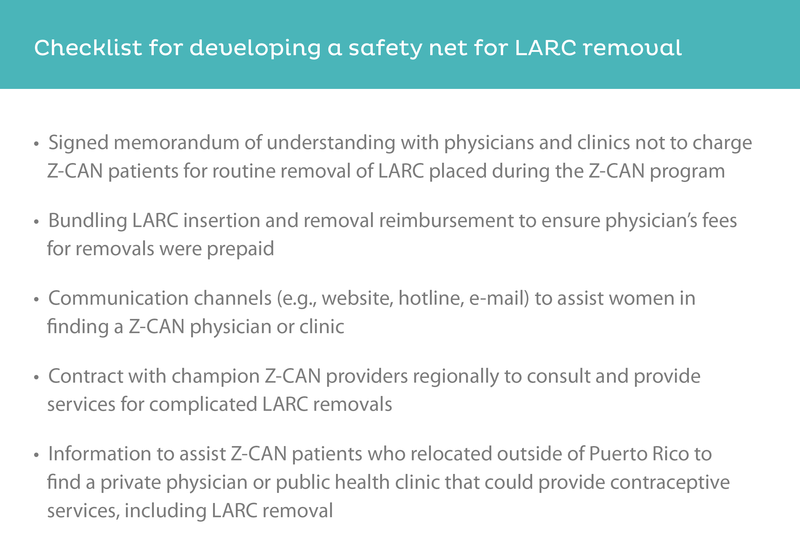 In addition, the Z-CAN program design ensured that LARC removal was available to women after the Z-CAN program concluded.  1.6 How do we ensure compliance with all regulations? It is important to ensure compliance with regulatory guidelines for distribution of pharmaceutical products. Your program or intervention must adhere to all applicable regulations and laws for distribution of donated or purchased contraceptive methods and must establish a chain of custody for contraceptive method distribution. Regulations for procurement and distribution of contraceptive methods vary across domestic and global settings. Consulting regulatory agencies and experts with knowledge and experience of the process will save time and ensure the timely distribution of the contraception methods from the pharmaceutical manufacturer, pharmaceutical distributor, physicians or clinics, and women seeking the contraceptive method. To comply with federal and territory regulations for distributing prescription contraceptives to Z-CAN clinics in Puerto Rico, the program established a chain of custody for donated and purchased contraceptive methods in consultation with the FDA, CMS, U. S. Department of Veterans Affairs, and the U. S. Department of Health and Human Services Office of the Inspector General. This chain of custody required Z-CAN to identify a licensed pharmaceutical distributor in Puerto Rico to receive contraceptives from the manufacturer, hold the product in a temperature-controlled and secure location, and then distribute the product to Z-CAN clinics. The PRDOH also issued waivers that allowed Z-CAN physicians to stock contraceptive methods in a locked clinic cabinet, which allowed for same-day access during the program. 1.7 What reimbursement issues should we address in planning? Reimbursement to health care providers for contraceptive services—including screening for pregnancy intention, client-centered contraception counseling, insertion and removal of LARC methods or other contraceptive devices, the actual cost of LARC or other contraceptive devices, and follow-up—is often insufficient. In addition, lack of adequate reimbursement may be a major barrier in recruiting and retaining providers. The needs assessment should determine if there are issues with contraceptive service reimbursement in both public and private health care systems. The assessment may indicate that health care providers practicing in different settings are reimbursed differently for contraceptive services. Inadequate reimbursement for contraceptive services was identified as a barrier to contraception provision in Puerto Rico. To address this barrier, the program established reimbursement for participating Z-CAN private practicing physicians. The reimbursement rate was comparable to Medicaid reimbursement rates in the continental United States. The reimbursement covered client-centered contraceptive counseling; provision of contraceptive methods; and for LARC methods, IUD and implant insertion and removal. This was especially important when women selected a LARC method. Reimbursement rates for IUD and implant insertions and removals were established as a single reimbursement (bundled reimbursement) after the insertion visit. This ensured that a woman could return to have her LARC method removed at no cost, even after the Z-CAN program ended. Federally funded clinics providing Z-CAN services received the full range of contraceptive methods at no cost to the clinic or patients from the Z-CAN program, but physicians did not receive a Z-CAN reimbursement for their services.